Can I get high yield toners for the Konica Minolta Magicolor 8650DN printer? The term high yield on our website is only used where there are two cartridges of the same colour for the same printer with different capacities. It's used to differentiate between the two cartridges. On this basis the Magicolor 8650DN doesn't use high yield toners because there is only one capacity for each of the four colours. However, because each toner can print at least 20,000 pages you can consider that the supplies for the Magicolor 8650DN printer are actually high yield toner cartridges in regards to them containing a large amount of toner for printing in high-volumes. The Konica Minolta Magicolor 8650DN printer is an excellent addition to offices in need of a quality printer for professional colour and black and white documents. This laser printer is built for heavy-duty use, capable of handling up to 150,000 pages per month. However, to reach its optimum lifespan, the manufacturers don't recommend reaching the limit regularly. The Konica Minolta Magicolor 8650DN laser printer, however, lacks multifunction capabilities but it guarantees increased productivity for workgroups. Designed for use in mid-size offices, the Konica Minolta Magicolor 8650DN A3+ colour laser printer is pretty compact at 25.3x27.9x25.1 inches. 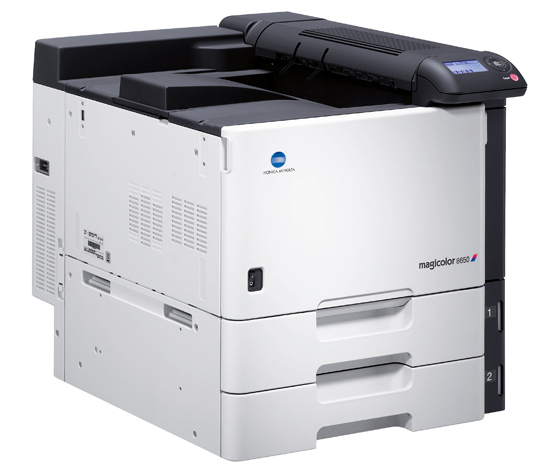 The Magicolor 8650DN printer boasts versatile connectivity options, including USB and parallel ports. Networking comes standard with the Konica Minolta Magicolor 8650DN model, along with duplex functions, and users can set the unit up with almost any Mac and Windows computer. With a 35 pages per minute printing rate, the Konica Minolta Magicolor 8650DN guarantees efficiency and increased productivity. Its maximum print resolution is also impressive at 9200x600 dpi. This device likewise uses individual Magicolor 8650DN toners in four separate colour cartridges, which makes it more economical to use than a colour inkjet printer using tri-colour cartridges which don't always allow the cartridge to deplete fully before needing replacement. The Konica Minolta Magicolor 8650DN large-format printer even has a 60GB hard drive and a built-in RAM of 1GB. Its lack of multifunction features puts the Konica Minolta 8650DN behind other laser printers that are capable of other basic office functions like copying, scanning, and fax. Otherwise, this dedicated printer is a good addition to mid-size offices with high volume print needs.